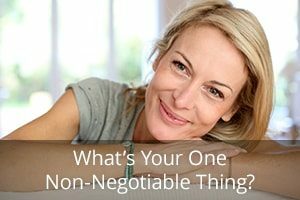 What’s Your One Non-Negotiable Thing? Jillian met Matt rock-climbing. It was a match made in heaven. Six months later, they’d moved in together and were on their way to happily ever after. Except, one year later, Jillian was no longer all that happy. She loved Matt. She still believed he was the One. But she didn’t always enjoy living with him. In fact, if she were honest, she didn’t enjoy their life together a lot of the time. Jillian was hoping I could change Matt. She thought he’d listen to me. What she wasn’t expecting was my advice to her. “What’s the one thing you do for yourself?” I asked her. Jillian had fallen into a common trap. 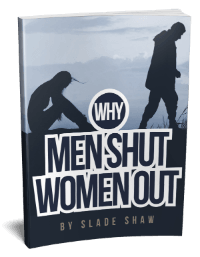 The trap of believing that being a couple means giving up your single pursuits. This trap is so easy to fall into. When you finally find someone, who syncs with you completely, you want to spend all your free time together. You can’t get enough of each other’s company. Everything is more fun when you do it together. And that’s fine in the early stages of dating. You don’t have all that much time together. You go home to separate beds, you both have jobs, and so you treasure the precious hours you have together. But once you merge your lives, you can swing to the other extreme. Now you’re always together. You end up with too much of a good thing. Counterintuitively, one of the most effective ways to keep the passion alive is not to be together 24-7 … but rather to build in a little distance from each other. You need your “me” time. It’s non-negotiable. What is the one thing you do for you—not for anyone else? Every week, take some time to do whatever it is that makes you come alive. It’s not bad for your relationship to go your separate ways from time to time. Rather, it gives you room to breathe. Couples can feel as if they give up their individual identities when they enter a relationship. 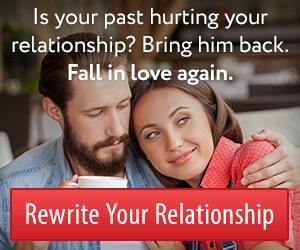 They lose track of the person they were before they got together. After all, the woman he fell in love with was the single you. The woman you were before you merged with him. Don’t lose sight of her. I’m not saying it won’t be tough. You may feel a bit awkward at first, especially if you’re used to being attached at the hip. You’ll probably miss him a little. After all, most things are better when enjoyed together. But not ALL things. Like a girl’s night once a week. Or a class in something that would bore him stiff. Or a leisurely garden stroll. Look for small opportunities to do things without him, like going for a walk even if he won’t budge from the couch, or attending a party on your own even if he isn’t in the mood. If he doesn’t want to do something, that doesn’t mean you can’t do it. You have the right to your own interests and passions. Taking time for yourself gives him the opportunity to feel what it’s like when you’re not there. Missing you is a good thing. For Jillian, that meant going rock climbing without Matt from time to time. It meant spending the occasional evening in bed reading while he watched TV in the living room. Giving herself permission to have “me” time every week gave Jillian her life back. And it helped her appreciate her guy’s company so much more. “He’s not such a bad guy when we’re not in each other’s hair all the time,” she smiled. Brilliant! Thank you James! I always love your advice!